Casting Associate For the New Vic: Over 50 plays including award-winning The Snow Queen (winner of UK Theatre Award, Best Show for Children and Young People); Around The World In 80 Days (co-production with Kenny Wax Family Entertainment, Simon Friend and Royal Exchange – winner of the Cameo Page to Stage Award). Current theatre credits: The Worst Witch – Northampton’s Christmas show but now on a national UK tour with the hope of transferring into the West End for summer, Around The World In 80 Days – New Vic but soon to re-rehearse for a short USA tour. The Giant Jam Sandwich (New Perspectives Theatre) soon to start its third tour. and UK Tour); Before The Party, Echo’s End, Aladdin (Salisbury Playhouse); Lost Boy, Alice in Wonderland (Theatre in the Quarter); Harvest; The Lovesong of Alfred J Hitchcock, and others (New Perspectives); Judgement Day (The Print Room); Precious Little Talent (Best Play at the London Theatre Festival Awards 2011 – Trafalgar Studios); Richard III, Macbeth, Othello (Ludlow Festival); Seasons for the Northcott Theatre Exeter and Bristol Old Vic including Henry IV Parts One and Two, The Notebook of Trigorin, Who’s Afraid of Virginia Woolf?, Antigone, The Beggar’s Opera, A Chorus of Disapproval, Betrayal (Bristol Old Vic). Television credits include: BBC2’s comedy drama series The Cup; The Bill (over 50 episodes); The Sarah Jane Adventures – Invasion of the Bane; two series of London’s Burning (32 episodes); The Knock (4 x 90-minute episodes). Other credits include: feature film Papadopoulos & Sons, West Is West, Mrs Ratcliffe’s Revolution, Out of Depth, The Jolly Boys’ Last Stand; drama-documentary: Curiosity – What Sank Titanic?, Mayday, Joan of Arc. Radio credits include: BBC Radio 4 political drama series Number 10. 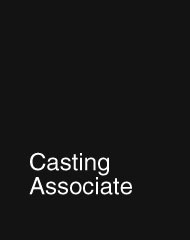 Anji is a member of the Casting Directors’ Guild of Great Britain and BAFTA.